A colonial mansion, a hereditary estate, I would say a haunted house, and reach the height of romantic felicity - but that would be asking too much of fate! John is a physician, and perhaps - (I would not say it to a living soul, of course, but this is dead paper and a great relief to my mind) - perhaps that is one reason I do not get well faster. If a physician of high standing, and one's own husband, assures friends and relatives that there is really nothing the matter with one but temporary nervous depression - a slight hysterical tendency - what is one to do? So I take phosphates or phosphites - whichever it is, and tonics, and journeys, and air, and exercise, and am absolutely forbidden to "work" until I am well again. I did write for a while in spite of them; but it does exhaust me a good deal - having to be so sly about it, or else meet with heavy opposition. I sometimes fancy that in my condition if I had less opposition and more society and stimulus - but John says the very worst thing I can do is to think about my condition, and I confess it always makes me feel bad. There is a delicious garden! I never saw such a garden - large and shady, full of box-bordered paths, and lined with long grape-covered arbors with seats under them. That spoils my ghostliness, I am afraid, but don't care - there is something strange about the house - I can feel it. But John says if I feel so, I shall neglect proper self-control; so I take pains to control myself - before him, at least, and that makes me very tired. The paint and paper look as if a boys' school had used it. It is stripped off - the paper in great patches all around the head of my bed, about as far as I can reach, and in a great place on the other side of the room low down. I never saw a worse paper in my life. One a those sprawling flamboyant patterns committing every artistic sin. It is dull enough to confuse the eye in following, pronounced enough to constantly irritate and provoke study, and when you follow the lame uncertain curves for a little distance they suddenly commit suicide - plunge off at outrageous angles, destroy themselves in unheard of contradictions. There comes John, and I must put this away - he hates to have me write a word. Nobody would believe what an effort it is to do what little I am able - to dress and entertain, and order things. The wall-paper, as I said before, is torn off in spots, and it sticketh closer than a brother - they must have had perseverance as well as hatred. But I don't mind it a bit - only the paper. But in the places where it isn't faded and where the sun is just so - I can see a strange, provoking, formless sort of figure, that seems to skulk about behind that silly and conspicuous front design. I lie here on this great immovable bed - it is nailed down, I believe - and follow that pattern about by the hour. It is as good as gymnastics, I assure you. I start, we'll say, at the bottom, down in the corner over there where it has not been touched, and I determine for the thousandth time that I will follow that pointless pattern to some sort of a conclusion. Looked at in one way each breadth stands alone, the bloated curves and flourishes - a kind of "debased Romanesque" with delirium tremens - go waddling up and down in isolated columns of fatuity. But, on the other hand, they connect diagonally, and the sprawling outlines run off in great slanting waves of optic horror, like a lot of wallowing seaweeds in full chase. . There is one end of the room where it is almost intact, and there, when the crosslights fade and the low sun shines directly upon it, I can almost fancy radiation after all - the interminable grotesques seem to form around a common center and rush off in headlong plunges of equal distraction. I don't feel able. And I know John would think it absurd. But I must say what I feel and think in some way - it is such a relief! Half the time now I am awfully lazy, and lie down ever so much. John says I mustn't lose my strength, and has me take cod liver oil and lots of tonics and things, to say nothing of ale and wine and rare meat. Of course I never mention it to them any more - I am too wise, - but I keep watch of it all the same. And it is like a woman stooping down and creeping about behind that pattern. I don't like it a bit. I wonder - I begin to think - I wish John would take me away from here! "What is it, little girl?" he said. "Don't go walking about like that - you'll get cold." gaining flesh and color, your appetite is better, I feel really much easier about you." "Better in body perhaps-- " I began, and stopped short, for he sat up straight and looked at me with such a stern, reproachful look that I could not say another word. The outside pattern is a florid arabesque, reminding one of a fungus. If you can imagine a toadstool in joints, an interminable string of toadstools, budding and sprouting in endless convolutions - why, that is something like it. When the sun shoots in through the east window - I always watch for that first long, straight ray - it changes so quickly that I never can quite believe it. By moonlight - the moon shines in all night when there is a moon - I wouldn't know it was the same paper. And that cultivates deceit, for I don't tell them I'm awake - oh, no! She didn't know I was in the room, and when I asked her in a quiet, a very quiet voice, with the most restrained manner possible, what she was doing with the paper - she turned around as if she had been caught stealing, and looked quite angry - asked me why I should frighten her so! I turned it off with a laugh. I had no intention of telling him it was because of the wall-paper - he would make fun of me. He might even want to take me away. 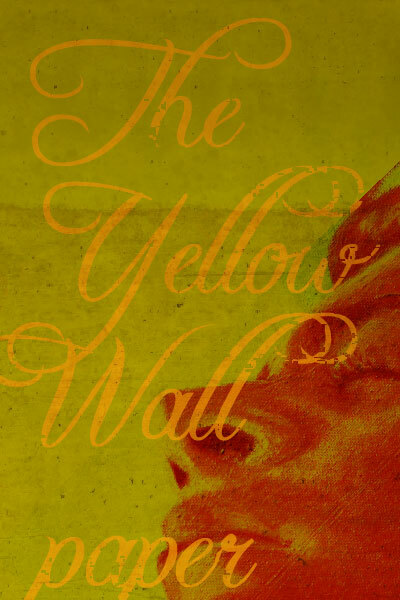 It is the strangest yellow, that wall-paper! It makes me think of all the yellow things I ever saw - not beautiful ones like buttercups, but old foul, bad yellow things. But there is something else about that paper - the smell! I noticed it the moment we came into the room, but with so much air and sun it was not bad. Now we have had a week of fog and rain, and whether the windows are open or not, the smell is here. It is not bad - at first, and very gentle, but quite the subtlest, most enduring odor I ever met. It used to disturb me at first. I thought seriously of burning the house - to reach the smell. I wonder how it was done and who did it, and what they did it for. Round and round and round - round and round and round - it makes me dizzy ! The front pattern does move - and no wonder! The woman behind shakes it! And she is all the time trying to climb through. But nobody could climb through that pattern - it strangles so; I think that is why it has so many heads. And I'll tell you why - privately - I've seen her! hides under the blackberry vines. Jennie wanted to sleep with me - the sly thing! but I told her I should undoubtedly rest better for a night all alone. But I am here, and no person touches this paper but Me - not alive! She tried to get me out of the room - it was too patent! But I said it was so quiet and empty and clean now that I believed I would lie down again and sleep all I could; and not to wake me even for dinner - I would call when I woke. I tried to lift and push it until I was lame, and then I got so angry I bit off a little piece at one corner - but it hurt my teeth. well enough that a step like that is improper and might be misconstrued. I don't like to look out of the windows even - there are so many of those creeping women, and they creep so fast. But I am securely fastened now by my well-hidden rope - you don't get me out in the road there ! Then he said - very quietly indeed, "Open the door, my darling!" Local prospectors wait expectantly for the return of Henry's wife.